Kai Scissors is devoted to providing the highest quality scissors and cutting products out there, which is why they've become experts and share their amazing products. If you're a sewer or a quilter then you're going to love the Very Berry Scissors Gift Set. This 5000 series 3-piece set is perfect for all your cutting needs. 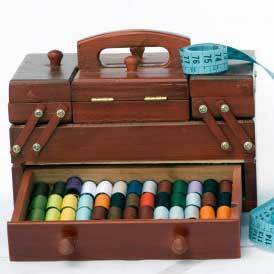 You'll receive 8 inch dressmaking shears, 5 1/2 inch embroidery scissors and 6 1/2 inch sewing scissors. Each has ergonomically soft handles, so you can cut comfortably without the added stress of hand-cramping. These scissors can cut through multiple layers of fabric and denim while trimming cottons without any fabric slippage; this will make the cutting process much easier and stress-free. The embroidery scissors are great for clipping threads, while the sewing scissors are perfect for cutting fusible appliqué pieces and trimming seams. Each of these Kai Scissors are made of hardened stainless steel and has smooth, sharp blades to give you that amazing cut. The handles are a very berry color to give you that chic, modern look in your craft room. You'll also be glad to know that each pair of scissors has a blade cover for additional safety and storage when not in use. If you're looking for professional-grade high performance scissors for your sewing and quilting projects then look no further than Kai Scissors. Thank you Christine Weiher an editor for Allfreesewing for reviewing the blue version of these scissors and letting us know more about these Kai scissors. They are a three piece set which I have never owned Dressmakers shears,embroidery and sewing scissors. I love scissors that the handles are soft and they can cut any fabric. Thats what sells me. I will check them out. How about You?